Acute encephalopathy with biphasic seizures and reduced diffusion (AESD) is a syndrome of encephalopathy characterized by biphasic seizures and altered consciousness in the acute stage followed in the subacute stage by restricted diffusion in the subcortical white matter on magnetic resonance imaging. The etiology of AESD has been attributed to viral infection like influenza A and human herpes virus 6. The exact pathogenesis of AESD is uncertain. Here we report a case of AESD, diagnosed based on clinicoradiological correlation. A 3 year old boy presented with seizures with biphasic course. Magnetic resonance imaging (MRI) of the brain revealed diffuse symmetric areas of restricted diffusion in bilateral cerebral hemispheres, mainly involving white matter with perirolandic and basal ganglia sparing. Follow-up MRI done after 4 weeks showed normalization of diffusion abnormalities. His clinical course and diffusion abnormalities on MRI were consistent with those of acute encephalopathy with biphasic seizures and reduced diffusion (AESD). A 3 year-old boy who was a known case of febrile seizures was brought to our hospital with an episode of focal seizure lasting for 12 min. Child had low grade fever prior to the seizure. On examination, child was febrile and in postictal drowsy state. Reflexes were brisk with plantars being flexor. No signs of meningitis or raised intracranial tension were detected. Patient was admitted in the ward and recovered from postictal state in few hours. After 3 days, child again developed an episode of complex partial seizure with perioral chewing. Subsequently, he became drowsy. On examination, child had altered sensorium and brisk reflexes. After recovery, mother also complained of diminution of child's vision. The visual evoked potentials were normal. Evaluation of blood, urine, and cerebrospinal fluid were negative for an infectious etiology. Serum chemistry, complete blood count, and liver enzymes were unremarkable. An initial electroencephalogram performed few hours after the termination of seizure was normal. On MRI of brain done on day 4, there were diffuse symmetric areas of restricted diffusion in bilateral cerebral hemispheres, involving mainly white matter. Adjacent cortices were also hyperintense [Figure 1]a-d. Corresponding areas did not reveal any signal abnormality on T1 and T2 weighted images [Figure 2]a and b. The perirolandic regions and basal ganglia were spared, excluding the diagnosis of hypoxic-ischemic injury. Also, clinically, delayed onset of encephalopathy after seizure is unusual for hypoxic-ischemic encephalopathy. Shaken infant syndrome and substance abuse or intoxication were the other differentials which were initially considered. Figure 1: Axial diffusion weighted images (a, b) and corresponding apparent diffusion coefficient (ADC) maps (c, d) of magnetic resonance imaging of the brain done on day 4, show diffuse symmetric areas of restricted diffusion in bilateral cerebral hemispheres, involving mainly white matter. The perirolandic regions and basal ganglia are spared. Figure 2: Axial T1 weighted (a) and T2 weighted (b) images, at the level of basal ganglia, show that corresponding areas of restricted diffusion do not reveal any signal abnormality. However, typical clinical scenario of biphasic seizures along with diffusion abnormalities on MRI leads us to the diagnosis of AESD. Polymerase chain reaction for human herpes viruses 6 and 7 was not performed. A follow-up MRI done after 4 weeks revealed resolution of diffusion weighted abnormalities and mild generalized cerebral atrophy [Figure 3]a-c. Although he had not returned to normal mental status, there was considerable clinical improvement as well. 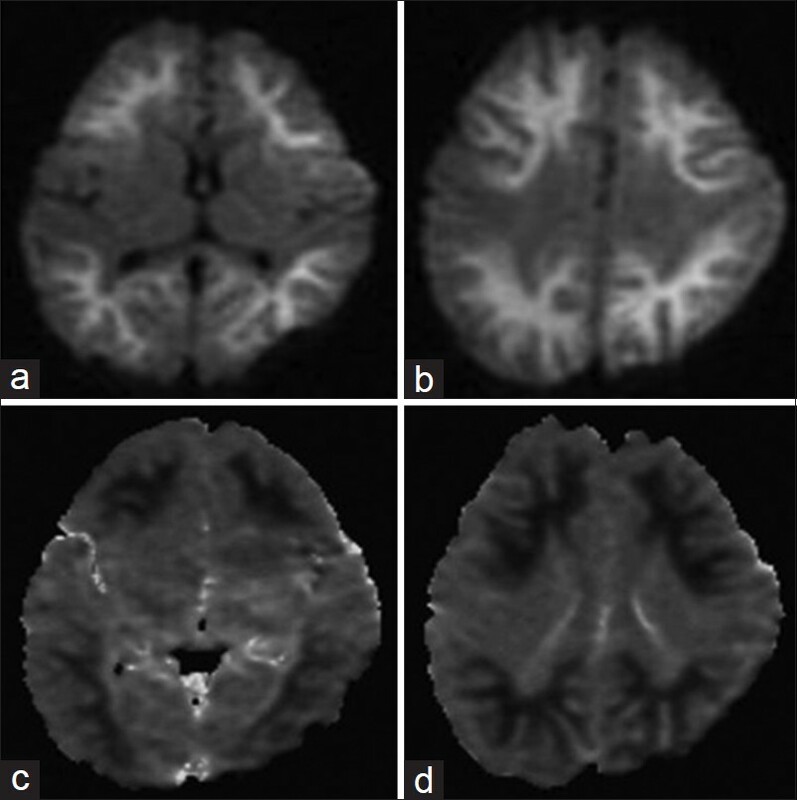 Figure 3: Axial fluid attenuated inversion recovery (FLAIR) (a), diffusion weighted image (b) and corresponding apparent diffusion coefficient (ADC) map (c) of magnetic resonance imaging of the brain done after 4 weeks shows resolution of diffusion abnormalities and mild generalized cerebral atrophy. Recently, Takanashi et al. described a form of AESD. Okumura et al. has suggested that acute encephalopathy with reduced diffusion in the bilateral hemispheres can be divided according to the pattern of brain lesions. Diffuse lesions were defined as reduced diffusion in the cortex and subcortical white matter in the bilateral hemispheres. Central-sparing lesions were defined as the lack of reduced diffusion in the areas around the bilateral sylvian fissures, though diffuse abnormalities were present in other areas on MRI. Patients with diffuse lesions were characterized by coma, severe abnormalities in laboratory test results, and poor neurologic outcome, whereas those with central-sparing lesions were characterized by a biphasic clinical course, less severe abnormalities on laboratory test results, and relatively mild neurologic sequelae. Imaging features and clinical course of the child in our case is consistent with central sparing lesions. In our patient, there was no evidence of hypoxia-ischemia, non-accidental head injury, or substance intoxication. Magnetic resonance spectroscopy study done by Takanashi et al. in three patients with AESD revealed decreased N-acetylaspartate (NAA) and elevated glutamine complex (Glx) during the week of presentation. Afterward, Glx normalized, whereas NAA remained low in two patients with neurologic sequelae but nearly normalized in the third patient without neurologic sequelae. These findings suggest that excitotoxic neuronal damage plays an important role in the pathogenesis of AESD and MR spectroscopy may be predictive of outcome. To our knowledge, not many patients have been diagnosed with AESD in India. Therefore, all physicians, especially paediatricians and radiologists should be aware of AESD, its clinical and imaging spectrum and its associated neurological morbidity. 1. Okumura A, Kidokoro H, Tsuji T, Suzuki M, Kubota T, Kato T, et al. Differences of clinical manifestations according to the patterns of brain lesions in acute encephalopathy with reduced diffusion in the bilateral hemispheres. AJNR Am J Neuroradiol 2009;30:825-30. 2. Takanashi J, Oba H, Barkovich AJ, Tada H, Tanabe Y, Yamanouchi H, et al. Diffusion MRI abnormalities after prolonged febrile seizures with encephalopathy. Neurology 2006;66:1304-9. 3. Tada H, Takanashi JI, Terada H, Tajima K. Severe form of acute influenza encephalopathy with biphasic seizures and late reduced diffusion. Neuropediatrics 2008;39:134-6. 4. Kuwata S, Senzaki H, Urushibara Y, Toriyama M, Kobayashi S, Hoshino K, et al. A case of acute encephalopathy with biphasic seizures and late reduced diffusion associated with Streptococcus pneumoniae meningoencephalitis. Brain Dev 2012;34:529-32. 5. Tanuma N, Miyata R, Kumada S, Kubota M, Takanashi J, Okumura A, et al. The axonal damage marker tau protein in the cerebrospinal fluid is increased in patients with acute encephalopathy with biphasic seizures and late reduced diffusion. Brain Dev 2010;32:435-9. 6. Morino S, Goto T, Ohtaki U, Miyama S. Acute encephalopathy with biphasic seizures and late reduced diffusion with visual disturbance and higher brain dysfunction. No To Hattatsu 2011;43:295-9. 7. Traul DE, Traul CS, Matsumoto J, Goodkin HP. 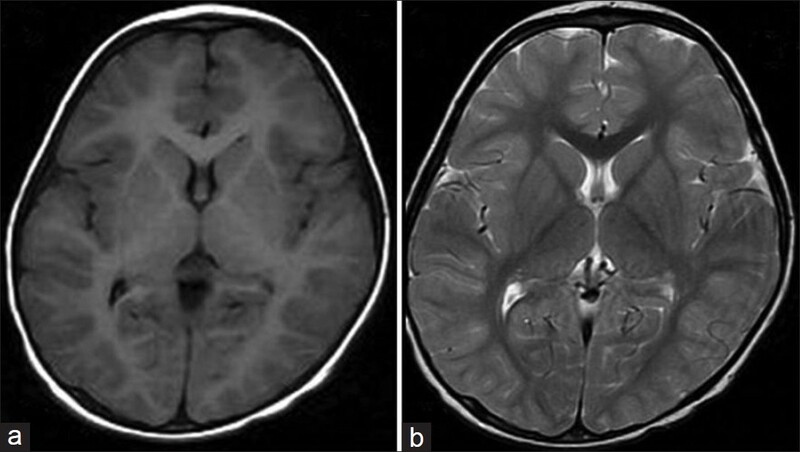 Acute encephalopathy with biphasic seizures and late restricted diffusion on MRI in a Japanese child living in the USA. Dev Med Child Neurol 2008;50:717-9. 8. Takanashi J, Tada H, Terada H, Barkovich AJ. Excitotoxicity in acute encephalopathy with biphasic seizures and late reduced diffusion. AJNR Am J Neuroradiol 2009;30:132-5.